iOS 8 is coming for your house. One of the many new developer tools Apple unveiled Monday at the Worldwide Developer Conference is HomeKit, a new suite of tools that will let the makers of smart home products integrate their wares more deeply into Apple’s mobile OS. 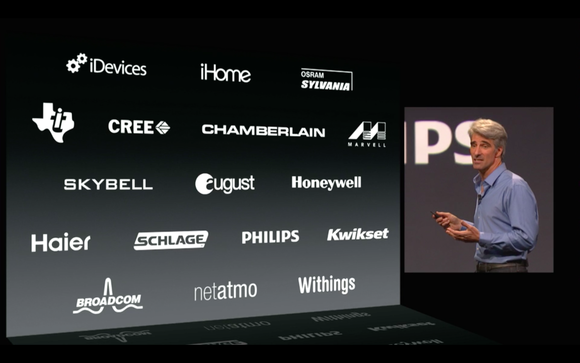 HomeKit is notable for what it isn’t. Apple didn’t pick one standard protocol for the industry to rally behind (at least not yet), like the way the company pushed adoption of USB by building it into the iMac. Apple didn’t announce its own hub or gadget, like the Revolv, to bridge multiple device protocols. HomeKit isn’t a single app on iOS, like Health or Passbook. Right now, most connected-home products worth their salt can be controlled by an iOS app, but users have to navigate to that app and open it to do anything. Who says Nest is best? 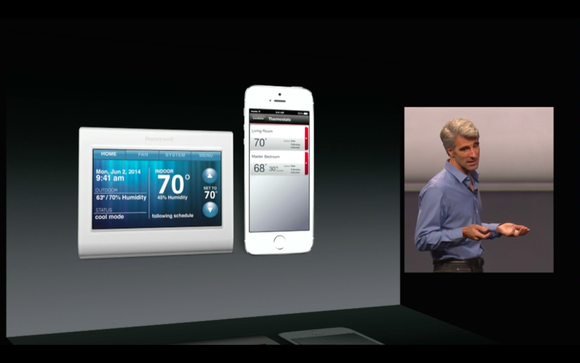 Apple's HomeKit will let Honeywell smart thermostats integrate with iOS 8. 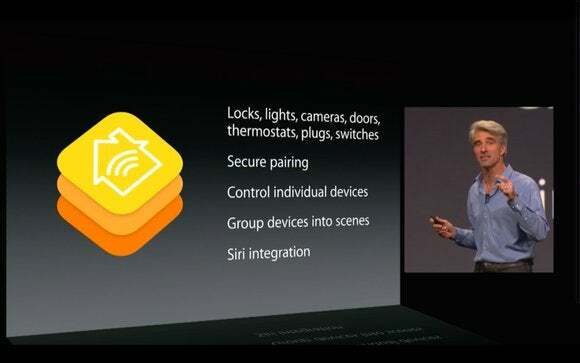 Instead, and as we predicted, HomeKit will allow users to control third-party smart-home gadgets from more places in iOS 8. HomeKit will let smart locks, lights, cameras, thermostats, plugs, and switches securely pair with your iPhone, so you can control individual devices, and even group devices together. You could tell Siri you’re going to bed, for example, and that could trigger a response from your entire home all at once, instead of you having to open the Nest app to turn down the heat, the Hue app to turn off your lights, and the August app to lock the front door. The geofencing feature in iOS could be huge for connected home devices too. You can already use IFTTT to program iOS location-based triggers with compatible gadgets like the Philips Hue lights and the Belkin WeMo smart outlets and switches. HomeKit should make that process easier by eliminating the extra IFTTT step. Now when your smart home sees your iPhone approaching, it will be able to flip on your porch light to welcome you home. The company has its eye on security too. Federighi says it will use “a common network protocol that has secure pairing so only your iPhone can unlock your garage door.” Look for Made for iPhone labels popping up on connected home appliances—Haier’s Tianzun air conditioner was spotted with a MFi label back in January by the eagle eyes at MacRumors. Apple is working with “leaders in home automation” such as Haier, Honeywell, and Texas Instruments to identify a consistent network protocol. Apple is partnering with some heavy hitters to keep the communication secure between your connected home devices and your iPhone. We can’t wait to learn more about HomeKit as we approach the launch of iOS 8 this fall.